Only makes us thinner (we hope)! Last week, I had my first appointment with a nutritionist. Mr. Wonderful and I resolved to fix our high triglycerides and, in his case, high LDL cholesterol and, in my case, obesity. The problem with trying to fix things that require a blood test is that you can’t immeidately tell how you’re doing. You have to wait until your next physical to figure out if what you’re doing is working or not. As for the obesity, the scale hasn’t been good to me. If my fancy-schmancy scale and my not-so-fancy math are correct, I’ve lost 7lbs of fat since January. (Not to be confused with 7lbs of total weight, which isn’t happening.) We’ve been trying a lot of different things, the latest being enlisting the help of a nutritionist. I left on Friday with a damaged ego and a new diet plan called the Omniheart Study. Not a lot has been published about the study or the diets that have been formulated as its result. It basically boils down to eliminating all the delicious baked goods that we’re so fond of and replacing them with fruits and vegetables. 11 servings of fruits and vegetables a day, to be precise. No, that’s not a typo. We’re allowed 4 servings of grains, 2 servings of protein, 2 servings of low-fat dairy, 2 servings of nuts (and legumes if that’s what you’re into but I’m not) and 1 serving of fat. Fat like oil and mayo, not fat like hot fudge. In it’s purest form, the diet includes a dessert, but my nutritionist put a big X through that section. Yesterday marked Day 1 on the new diet. We started with our standard Fiber One Raisin Bran. We should have added a fruit, but we hadn’t been to the store yet. Hopefully those raisins count. For lunch, we had tuna sandwiches on Sandwich Thins instead of bread. I had a side of broccoli (actually, it was more like I had broccoli for lunch with a side of tuna sandwich). Mr. Wonderful had a plum. We had frozen blueberries for dessert. We slept through snack time (yay holidays) which should have been 1/4 cup of nuts. 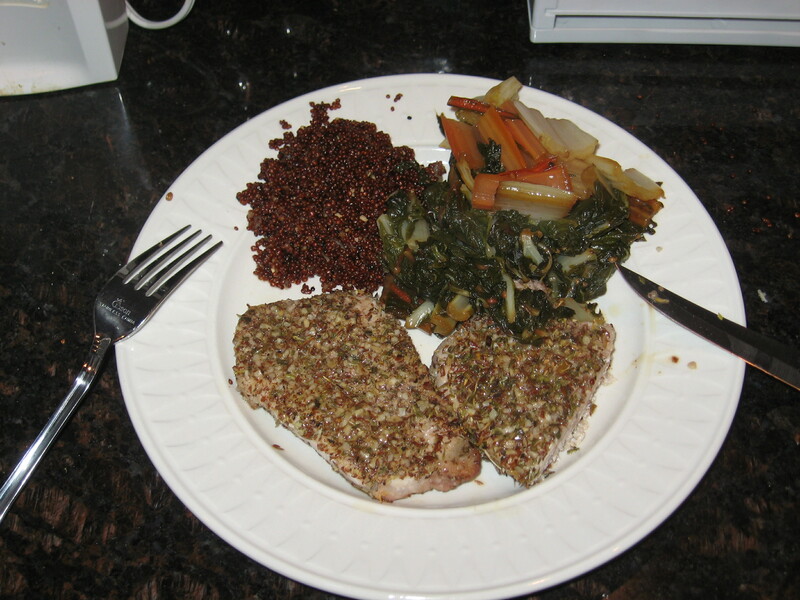 For dinner we had 6oz of pork (seasoned with oregano, thyme, garlic flakes, salt, pepper and flaxseed meal – delicious! ), our first experience with swiss chard and red quinoa. Reviews: Swiss Chard? Yay! Red Quinoa? Boo! I followed this up with vanilla greek yogurt and frozen cherries. It was kind of like eating cherry vanilla ice cream. I’m not even just saying that to make myself feel better. The biggest frustration was trying to figure out what constitutes a serving. We typically measure our portions with our handy food scale, but this diet is based on cups. We’re to have 3-4 cups of vegetables a day. But I don’t know if that’s cooked or uncooked. Swiss Chard wilts fast, kind of like spinach. We had one cup cooked, but I don’t know if that was enough. Our other frustration is that it’s a lot of food. I haven’t eaten this much food on purpose in a really long time. We had huge salads at lunch and then, surprise, we needed to eat more snack and an equally huge dinner. As I write this, I’m pretty sure I’m short on nuts but I can’t bear to put any more food into my mouth. Oh well. We’re giving this diet until I go back to the nutritionist at the end of July. As you can probably guess, it’s not a diet focused on weight loss, so I’m not sure how we’ll tell if we’re doing it right. Hopefully it gets easier! This entry was posted in Culinary School Graduate, Where It's At and tagged cooking, diet, healthy eating. Bookmark the permalink.